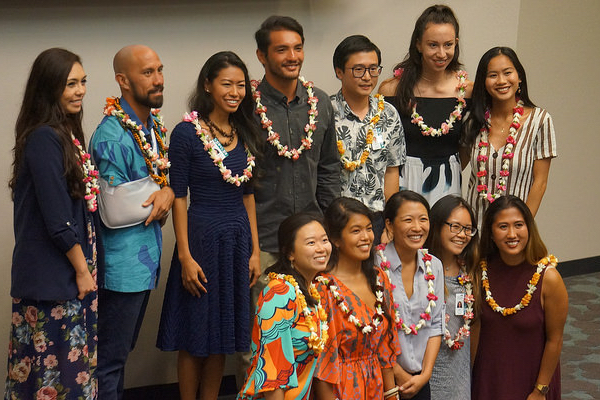 Pictured: The ʻImi of 2018-2019: aspiring physicians who seek entry into the study of medicine. With a greeting from Dean Jerris Hedges and the support of past ʻImi on hand to guide them, the incoming learners in the ʻImi Hoʻōla (Those Who Seek to Heal) Post-Baccalaureate Program were officially welcomed into the John A. Burns School of Medicine (JABSOM) at the University of Hawaiʻi tonight. The 12 aspiring doctors are all college graduates, selected for the promise glimpsed in each of them. Each year, up to 12 men and women are selected to study medicine and the humanities in what seems like hyper-speed. In the span of a year, they will cover subjects that range from biochemistry to how to conduct a patient exam, and everything in between. These are smart, talented students who come from disadvantaged backgrounds or underserved communities, or both. 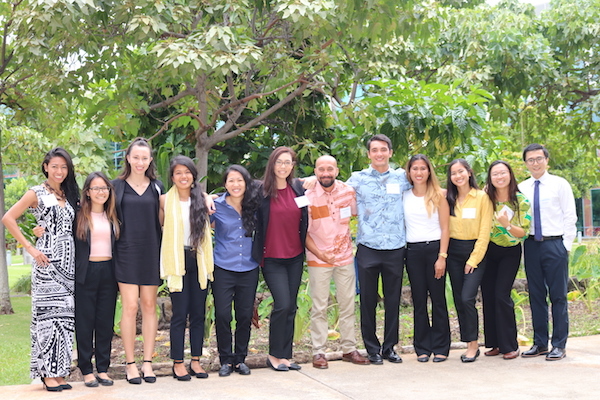 ʻImi Hoʻōla exists to give them the opportunity to compete for a spot in next year’s incoming JABSOM MD Class of 2023. 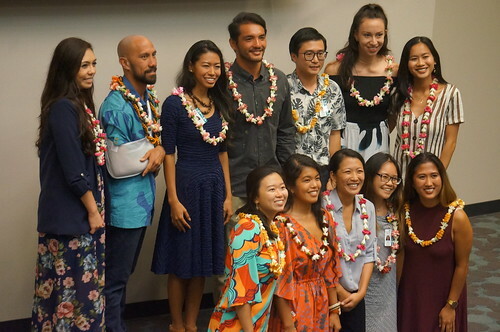 The first medical students to be admitted into the 2023 class (which begins next July, 2019) will include each one of the 12 ʻImi who successfully complete the baccalaureate program. ʻImi is an intensive immersion into the study of medicine and the communities in Hawaiʻi and the Pacific in need of medical care. It is grueling but for those who complete it, glorious, too. More than 250 physicians have gotten their start by the preparation ʻImi provides. About 40% of them are Native Hawaiian doctors. A critical part of the ʻImi program comes from the generosity of The Queen’s Health Systems, which provides a monthly stipend to each ʻImi so that they may forgo working a job while they toil towards earning a career in service of others. Our ʻImi this year include candidates Krystal Anderson, a Pearl City High School and UH Mānoa graduate; Samuel Andrade, a Kailua resident who graduated from Kamehameha Schools and UH Mānoa graduate; Bianca Calio, a Mililani resident who graduated from Sacred Hearts Academy and the UH Mānoa; Marjorie Anne Daria, from Tinian in the Northern Marianas, who graduated from Tinian Senior High School, and with degrees from the University of Connecticut and the University of South Florida; James DeJesus IV of Mililani who graduated from Kamehameha Schools and the University of Puget Sound; Weiming Du of Zhonghan, China, who graduated from Zhongshan No. 1 Middle School (China) and from the UH Mānoa; Bree Kaneakua, from Hilo, who graduated from Kamehameha Schools Keaʻau and Creighton University; Jenna Maligro of Mililani, a graduate of Mililani High School and the UH Mānoa, Lynn Nguyen, of Honolulu, who graduated from Punahou School and the UH Mānoa; Tana Ramos, from Guam, who graduated from the Academy of Our Lady of Guam and the University of California at San Diego; Natalie Tejero Subia, a graduate of Farrington High School and UH Mānoa; and Sharon Wong of Honolulu, who graduated from Kaiser High School and UH Mānoa. Best wishes to the 12 who are embarking on one of the most challenging programs in all of JABSOM! Stay tuned for a video from the event on UH Med Now soon!